Hampshire horticulturalists Robin Wallis and Mark Straver are from Hook-based nursery Hortus Loci. You may not have heard of them because the retail side of their business goes under a different name -Whitewater Nursery and Garden Centre, but they are the ‘go-to’ people for many top garden designers at Chelsea Flower Show. Chelsea 2012 really put them on the map. “For our gardens to get three gold medals and Best in Show was quite an achievement” says Robin. Supplying the show gardens is not an easy job.”It’s good fun, it’s stressful and it’s a huge logistical nightmare to get it all up to London in ten days in good condition”. Only the best plants make a show garden. “When we are growing plants, say a bearded iris which is very ephemeral, the flowers will be out for three or four days and whatever you do, some will be ahead of others and some will be behind. You’ll end up with only about a dozen out of a batch of 100 that will go up to the show and only about 8 of those will get used,” says Robin. Everything is very weather dependent and a lot of it is quite panicky because everything happens in the last 10 days – suddenly things start opening up. The designers have to hold their nerve but the main thing is to inform them at the beginning what’s unattainable. There’ll be the ‘no ways’, the ‘we’ll try and if it works it will be fantastic’ and the ‘dead cert’s’. The designers come and see their plants throughout the growing period but they also look at the Chelsea extra’s – plants chosen and grown by the nursery that are on stand-by in case a first choice plant doesn’t make it. 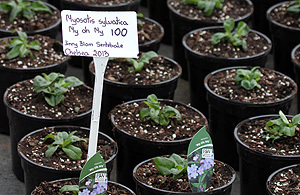 Sometimes these plants get used at the show too, maybe even on the strength of a name. The designers are usually very open to suggestions before everything is too nailed down. “If they come with a broad mind they get a good result,” says Robin. Craig Wade is in charge of growing the show plants and has his work cut out. Last year they were really battling the elements. It was a very cold winter followed by the wettest April on record. 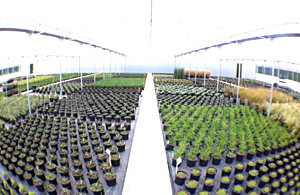 The large poly-tunnels at the nursery offer a three degree lift but only if the sun’s out. If there’s no sun, the tunnel just keeps the rain off. He has rows and rows of plants to nurture. Some of the plants are integral to the design of a garden such as the Forget-me-nots for Jinny Blom’s B&Q Sentebale garden. Translated, ‘Sentebale’ means ‘Forget-me-not’ so it is unthinkable that the garden would not contain them. They are coming along nicely now but the British weather can throw anything at the Hortus Loci team in the Chelsea run-up. After the show, there’s still a lot going on for the nursery. Although some gardens have a big sell off at Chelsea, many of the Hortus Loci plants come back to the nursery and Robin and Mark hold a ‘Chelsea comes to Hook’ open day in June where you can buy your own piece of the most famous flower show on the planet.